Want to clean and or size grain or seed? We sell New Light Foot grain cleaning machines,and we can get any used machine that you want. 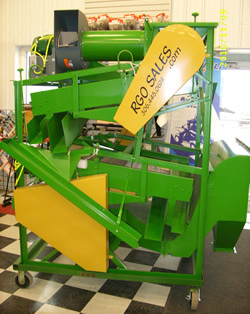 Screens, augers, mills, bin sweeps, conveyors, seed separators, debearders, dethrashers, feeders, and moisture testers. Air, hydrolic or vibratory, mobile and stationary equipment, we can get it all. We also sell Grain Legs, Destoners and indents. Let us know your needs, anything that is used to clean grains, we can get it.